Amid all of the hoopla surrounding the Samsung Galaxy S3, launch you'd be forgiven for missing the appearance of a five-star app yet to land on Android. Yes, the Flipboard customisable digital magazine was ever-so-briefly shown running on the 4.8-inch, quad-core Galaxy S3 during one of the many video presentations. Flipboard, which brings together news from your favourite websites and links posted by your social networking pals, creates an immensely attractive, endlessly-refreshable magazine. The company, which currently offers the app for iPad, iPhone and iPod touch confirmed the impending launch and told Android fans to expect an arrival this summer. 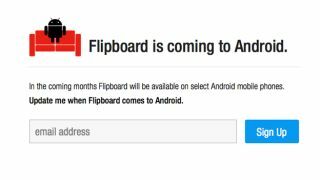 In a Tweet, the Flipboard creators said: "Previewed on Samsung S III today, Flipboard is coming to Android phones soon." The company confirmed to AllThingsD that it has penciled in a "summer" launch, but stopped short of confirming an actual date. The app will not be universal on the Android platform and will be launched initially on select phones and tablets. At least we know the Samsung Galaxy S3 will be one of them.